On Wednesday, April 11th Lighthouse Works hosted a Community Dinner entitled BAKED at the Community Center. 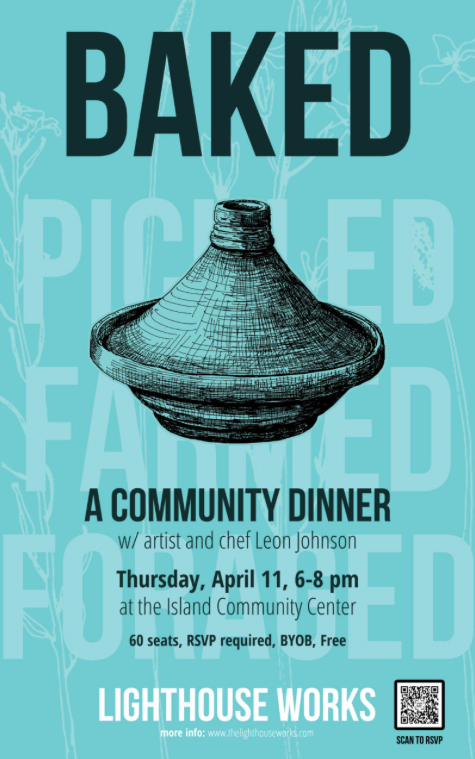 BAKED, was the first in a series of four community dinners, hosted by Lighthouse Works and prepared by artist and chef Leon Johnson, and features a menu of foods that are predominantly baked. Guided by an interest in production, these dinners are part of a broader initiative at Lighthouse Works to realize the ways that our kitchen can serve as a resource for both our artists and broader community. A grand evening was enjoyed by all as Chef Leon dazzled us with delicious tastes and exotic spices that conjured images of warm Moroccan nights. 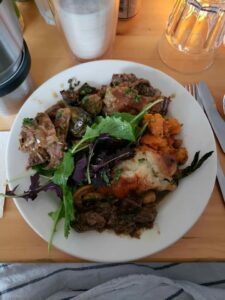 We started with homemade spiced flatbread and hummus, and then moved on to Chicken Tajine with Apricot Couscous, Steak & Parsnip Pies, Chicken & Mushroom Pies, as well as Asparagus and Cheddar Pies. There were also Chicken Hand Pies and Baby Greens with Edible Flowers. 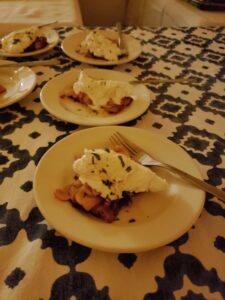 We were also treated to Flatbread Pizzas with Burrata. After the main course was an assortment of refreshing fruit drinks: Mango Lassi, Watermelon Smoothie, and an Avocado and Mint Smoothie. That was followed by a dessert of golden Tarte Tatin with Lavender Whipped Cream. The upstairs Multipurpose Room was transformed into a festive dining space, with daffodils on the beer garden tables, blue and white cotton napkins, and every surface adorned with glowing votive candles. 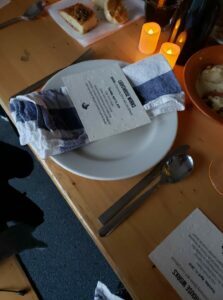 Many thanks to the generosity of Lighthouse Works which brought our community together for a delicious and memorable evening. Keep an eye out for the next Lighthouse Works Community Dinner, on Thursday, June 13th, and will featured PICKLED foods.